Manhunt in South Philadelphia for man who fled after police chase, crash. Maggie Kent reports during Action News at 4pm on January 9, 2019. SOUTH PHILADELPHIA (WPVI) -- A manhunt continues in South Philadelphia for the man who fled on foot after a police chase that began in Delaware and resulted in two separate crashes in the city. 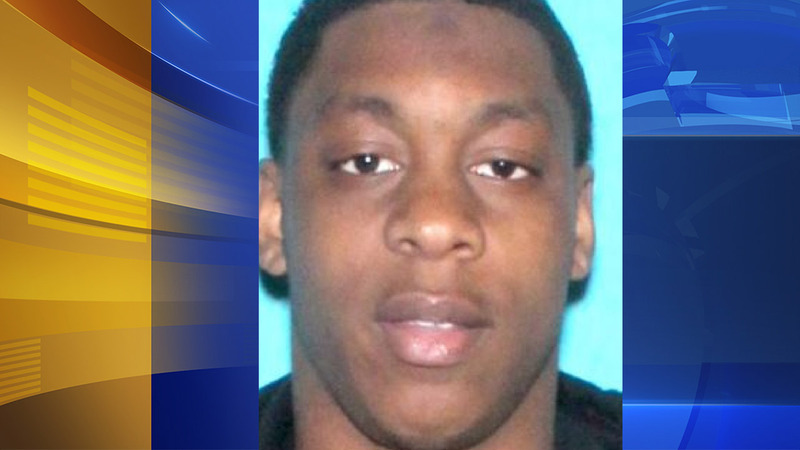 That man has been identified as 20-year-old Dejuan Robinson. Robinson remains on the loose after ultimately crashing the car he was driving into a SEPTA bus at Broad and Oregon and then fleeing on foot. However, the search for Robinson has been significantly curtailed after Wilmington police clarified that the suspect is only wanted for felony parole and probation violations, not multiple homicides as initially reported. The first crash happened late Wednesday morning in the northbound lanes of Interstate 95 between the Philadelphia International Airport exit and Broad Street. Police in Wilmington, Delaware say this all began when officers tried to pull Robinson over in the area of E. 12th Street and Rosemont Avenue just before 11 a.m.
Robinson fled and got onto I-495 northbound, eventually merging onto I-95 northbound. Wilmington police said as the pursuit was underway near Philadelphia International Airport, Robinson intentionally rammed another car on I-95, which resulted in one of the Wilmington police cars flipping over. In all, five Wilmington police officers were injured, two of them when their car flipped on I-95. Scene of crash involving police during pursuit on I-95 on January 9, 2019. The suspect then made it off the highway, where his black Acura was involved in a collision involving a white SUV and a SEPTA bus at Broad Street and Oregon Avenue. "He then gets out of the vehicle and flees on foot," said Philadelphia Police Capt. Sekou Kinebrew. A large number of heavily armed police officers, K-9 units and law enforcement helicopters converged in the area after it was initially believed Robinson was an armed and dangerous killer. At one point during the search, several officers rushed into a home in the 2900 block of Smedley Street after a woman heard glass breaking outside her window. "I'm glad it wasn't him, but I'm kind of upset it wasn't him because I want him to be caught," that woman said. Several Philadelphia schools were on lockdown Wednesday afternoon, but students were dismissed to their parents amid police protection. It was later learned that the suspect who police said has ties to a Wilmington gang and did time in prison did not have active warrants for homicide. "He is however wanted for parole and probation violations in Delaware, and the underlying offense of the violations do involve firearms," said Kinebrew. This isn't the first time Dejuan Robinson has made headlines. In September 2015, when he was 17 years old, he broke out of a juvenile correction van while being transported in Wilmington. Robinson allegedly kicked out the window and jumped from the moving vehicle while still in shackles. Police are searching for a teen who escaped from a juvenile correctional van while being transported to court Wednesday night. This is the second Delaware police chase that ended up in a South Philadelphia crash in as many weeks. Last week, on New Year's Day, a Delaware man crashed and killed three people, two of whom were in the Mummer's parade. Residents in the area are not too happy about all of this. "This is the same kind of situation, chasing somebody from Delaware, winding up over here in the city," said Nick Cirillo. "It has a big impact in the community right now." Wednesday's high-speed chase across state lines has stirred controversy and sparked an internal investigation by Wilmington police. In addition to the five Wilmington officers, a Pennsylvania State Trooper was also injured in Wednesday's chase. All were said to be non-life threatening injuries.